Wild pansies and violets are among most people's wildflowers, and the Dune Pansy (also referred to as the Seaside Pansy) is one of the prettiest and most varied of them all. A wildflower of dry sandy grassland, and coastal sand dunes in particular, this perennial plant can grow to 15cm in height but in the exposed locations it tends to favour is usually no more than 5 to 10cm tall. Wild Pansy Viola tricolor subsp. tricolor, commonly referred to as Heartsease, is an annual or sometimes perennial of cultivated land; it grows rather taller (up to 45cm in height occasionally) than Dune Pansies do (perhaps due to being mnore sheltered from strong winds) and its petals are most often mainly or entirely mauve. Flowers of the Dune Pansy have five petals, the top two overlapping slightly; there are two smaller wing petals and a single large lower petal with radial reddish-brown lines (honey guides) in the central third of the petal. The leaves are toothed, oval with a heart-shaped base and leaf-like pinnately-lobed stipules. 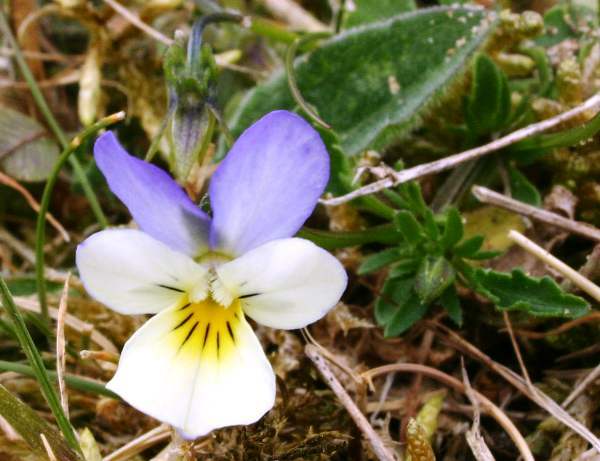 On mainland Britain Viola tricolor ssp. curtisii is mainly confined to the western coast, although there are a few sites in East Anglia where Dune Pansies are quite common. The coast of Wales, particularly around the Isle of Anglesey, is particularly good for this species, as also are dune systems forther north in Lancashire and along much of the west coast of Scotland as well as the Scottish western islands. Dune Pansies are also found along nearly all of the coast of the Irish Republic and Northern Ireland. 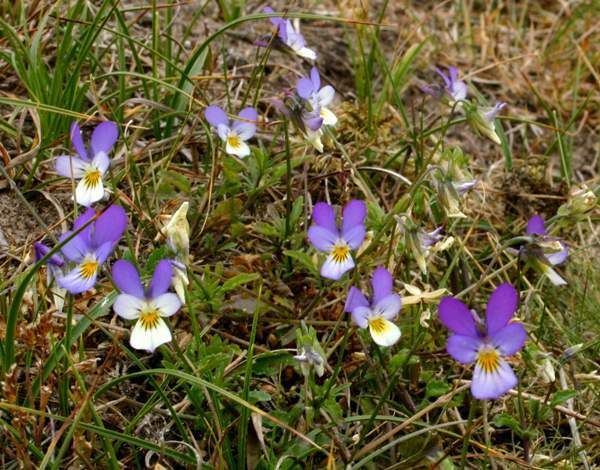 On mainland Europe Dune Pansies are recorded along much of the Atlantic coast and in some places on the southern coast of the Baltic Sea. 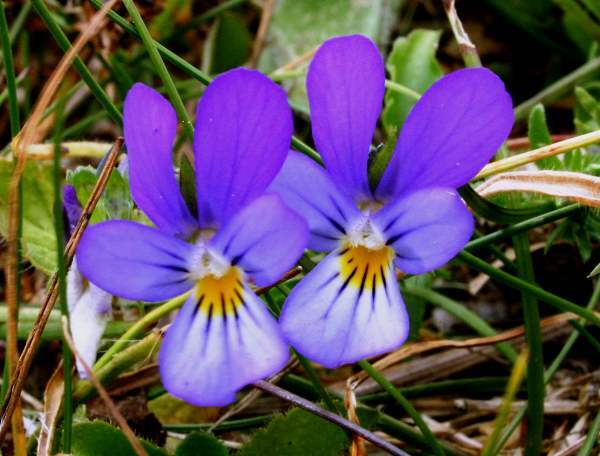 Almost entirely coastal, the Dune Pansy is aptly named because its main habitat is sand dunes; however, in the past these wildflowers were often transplanted to sandy inland gardens too. In Britain and Ireland Dune Pansies can be found in bloom in springtime and again in the autumn, and so it is usually possible to find flowers in prime condition from April right through to September. 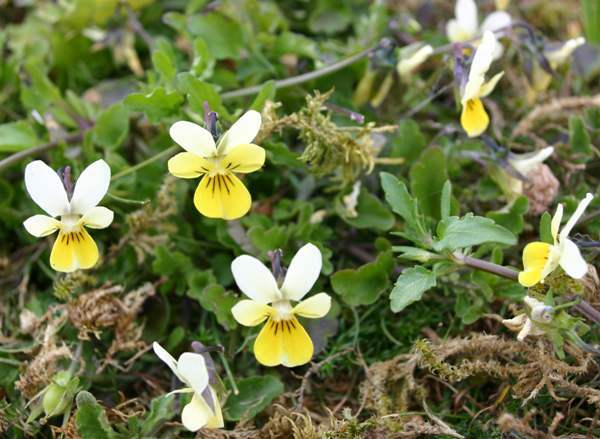 The Dune Pansy has larger flowers than the tiny Field Pansy Viola arvensis which has yellow flowers and grows in unimproved permanent pastures inland but is otherwise quite similar, with difference mainly in sepal to petal size ratios. Common Dog-violet Viola riviniana and Early Dog-violets Viola reichenbachiana favour woodland edges and shady banks beneath hedgerows. Sweet Violets Viola odorata, usually the first violet species we find in the wild in Britain, have downy stems and leaves; they grow in woods. As the name suggests, they have a strong and pleasant scent. The Dune Pansies shown on this page were photographed at various sand-dune locations around the coast of Wales.